Recording on location provides a unique set of challenges, which for many people are more likely to be termed frustrations. Sometimes, a live venue can provide a wonderful set of acoustics that supports music (particularly in the case of acoustic instruments and the human voice), but this is often because the building in question has at least partially been designed with intelligibility of voice and music in mind. In many environments, however, acoustics have obviously come way down the list of design priorities, if they have been considered at all. Many of us will be faced with the problems of live recording in an unfamiliar venue at some time, from the local band rehearsing in a church hall to the world-famous rock star who fancies recording his latest opus in the comfort of the ballroom in his French chateau. In these situations, it is only possible to alter the acoustics in a 'quick and dirty' way, since none of the changes can be permanent. Two of the biggest problems are likely to be excessive reverberation (attempting to record a band in an empty hall or practice room springs to mind), and lack of separation (a huge mush of sound, where each microphone captures large amounts of unwanted adjacent instruments as well). 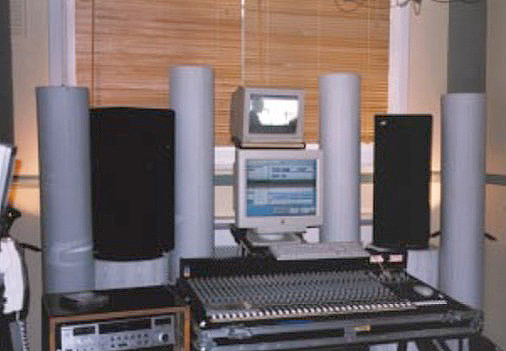 Most studios are likely to have several different recording areas for individual instruments, as well as a variety of movable acoustic screens to aid separation (see Part 2 of Improving Studio Acoustics, in the August '98 issue, for more details). Although you can cart about acoustic screens on location, they tend to be heavy and unwieldy things, and not the sort of item you can pop into the back of a car. Enter Studio Traps, which are distributed in the UK by Soundfield. These are a part of the Tube Trap range, which have been used for some years to combat just these sorts of problems. 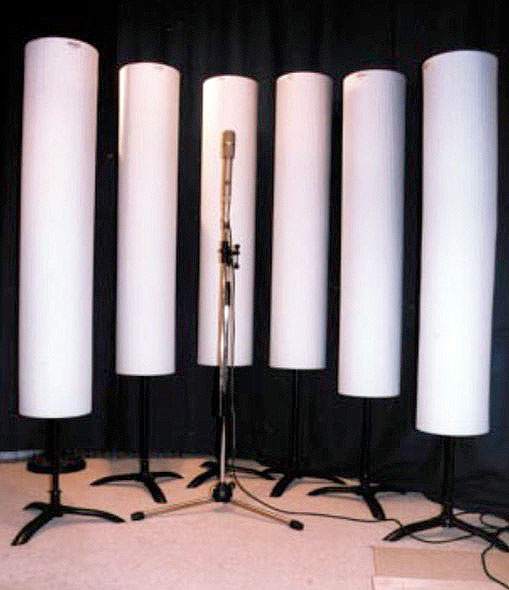 Designed by Acoustic Science Corporation in the USA, Tube Traps are free-standing, cylindrical‑shaped sound absorbers that can be used in groups to control acoustics wherever you need them. Used by such famous personages as Hugh Padgham, Roy Thomas Baker, and Pete Townshend, they are ideal when you need a quick but reliable way to combat problems with room resonances, reflections, and reverberation. Studio Traps are essentially hollow cylinders made from densely woven fibreglass, and because of this are fairly light (about 10 pounds each). They are nine inches in diameter and four feet high, and have an integral tripod stand, which can be adjusted to give an overall height adjustment of between 4.5 and 6.5 feet. Besides being a wide-band absorber, claimed to work down to 110Hz when corner-loaded, one side of each cylinder is covered with a 'sound reflecting membrane' which reflects sound above 400Hz while letting lower frequencies pass through it to be absorbed. This diffuses the sound above 400Hz, so you can retain some brightness in your recorded sound, while still controlling lower frequencies. Since the cylinders can easily be rotated, you can quickly adjust the amount of diffusion to suit the recording (the reflecting side is clearly marked on the top of each tube). Used in an open space, the lowest treated frequency is about 250Hz, but larger free-standing Tube Traps are also available for dealing with low frequencies (as well as half-cylinder traps to attach to flat surfaces such as walls and ceilings). The minimum number of Studio Traps recommended is six (and preferably eight). Because of their tripod bases, they can be quickly arranged in a line, curve, or a circle, either tightly grouped or spaced up to about 18 inches apart. Various arrangements are suggested for different applications, the simplest of which is for vocal tracks in a small area — you can set them up in a horseshoe pattern around a mic anywhere in a control room or other venue, leaving the open end for access. If, for instance, you have some space at the back end of your studio, it is possible to create an 'acoustic island' which has a natural acoustic inside, but which still has useful separation from the rest of the room. Soundfield drove over with six Studio Traps for me to try out — four fitted across the back seat of a family car, and a further two fitted neatly in the boot. I tried various recordings, and the most revealing were in an acoustically untreated area at the far end of my project studio. As you might expect, the most useful test turned out to be the human voice. Initial recording without any help from the traps showed a honky room resonance, along with an alarming amount of unwanted background noise from my PC (mostly fan‑related). I then set up the recommended horseshoe array of Studio Traps, forming three quarters of a circle, with the open quarter facing away from the console, monitor speakers, and PC. Although I only had six traps to work with, making the gap between each of the traps the same width as their diameter still left me with an overall recording area with a diameter of about four feet. This gave plenty of space to 'get in' with the mic, which was positioned at a suitable height in the centre of the horseshoe. Then, to gain the maximum effect from the Studio Traps, I raised each tube to almost ceiling height. First of all, I tried turning all the Tube Traps' reflecting sides 'outwards', so that the interior of the horseshoe got maximum absorption. 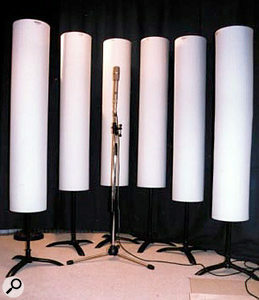 After further recordings using various acoustic instruments and the spoken voice, I then rotated each of the tubes to place the reflective sides 'inwards', to provide maximum reflection, and repeated the same test recordings. Listening to the various recordings made for an interesting experience. As you might expect, all the recordings made using Studio Traps were much better than those done in the untreated room, sounding a lot more controlled and balanced. With the absorbing sides inwards, the recording showed a dry, dead acoustic, with a surprising amount of attenuation of the PC noise (considering the large gaps between each tube), as well as removal of the resonant aspect of the room. If you needed an intimate sound, this would be an ideal arrangement. The reflective recordings again showed good attenuation of unwanted room acoustics and background sounds, but (as expected) with a brighter characteristic, and a more natural result, due to the reflections coming back above 400Hz. Depending on the diameter of your horseshoe, these will start arriving several milliseconds later — the speed of sound in air is about 1,125 feet per second, so a four-foot diameter circle will yield initial reflections about 4mS after the direct signal. Due to the diffused nature of the reflection pattern from each cylindrical reflector, and the number of tubes in use, ASC claim that these reflections are statistically random. You might think that the dead recorded sound would be more useful, but as anyone who has ever worked with reverb units knows, early reflections are vital in creating a 'real' environment, because they establish the character of the room. Often, even if sounds are recorded and used dry, a little ambience is later added so that they 'sit' better in the mix. Used with their reflective sides, Studio Traps add 'life' and support to sounds, while still removing unwanted coloration from the room acoustic, and providing useful separation from other instruments. However, the direct sound remains unaffected, since there will always be at least a few milliseconds before the start of the group of early reflections. Another advantage of the Traps is the dense pattern of early reflections that they provide. If there were only a few reflections, these could cause problems with comb-filtering coloration, but ASC claim 30 or more random reflections from the tube array, which averages out and eliminates any possible comb response. They term this the Quick Sound Field (QSF). These dense early reflections also provide a consistency of sound within the enclosed area — this also means that there will be less variation in the sound if a performer moves a little during the take. Studio Traps can also be used in the control room when mixing. Many of the problems of imaging and coloration in control rooms can be caused by strong early reflections from nearby pieces of studio equipment, which add 'clutter' to the sound and compromise the stereo imaging. By placing some traps in an absorptive row between your nearfield monitors, you can greatly reduce many of these early reflections, which should help the stereo imaging a great deal. ASC term this the 'Attack Wall', and in conjunction with other items in the range, such as the Monitor Stand (a combined stand and bass trap tuned to 60-70Hz to minimise vertical room modes), and larger floor-mounting Tube Traps which work down to lower frequencies, ASC claim that the Attack Wall provides "crystal clear imaging with a tight well-defined bass and plenty of punch." The Attack Wall set includes bass-trapping monitor stands, and is ideal for control room applications.I tried arranging them in this way, and my stereo imaging certainly improved, making it easier to pinpoint where each instrument was in various recordings. You can also try adding more traps at the rear of the room with their reflective sides pointing back into the studio, to diffuse these reflections — this combined approach is the classic LEDE (Live End Dead End) design. Another design approach is to add lots more early reflections at the front of the room, providing a louder and wider soundfield (at the expense of imaging), which you can try by rotating the Studio Traps to place their reflective sides forwards. While the Dead End approach was far more effective to my ears, the beauty is that it only takes a few seconds to turn them round to try. I also tried a line of traps behind my listening position, again with the absorptive sides pointing towards me, which made the back of the room seem to disappear. At just over £300 each, Studio Traps are certainly not a budget solution for people who occasionally have to deal with live recording problems. However, for those who are regularly involved with live recording (whether out and about or in the studio), they are an exceptionally quick and easy way to improve local acoustics. Their biggest strength is their portability, not only making it easy to transport half a dozen in the back of a car, but also giving them supreme flexibility when setting up. From locating the source of the problem, it only takes a couple of minutes to erect a custom recording area. In addition, while the air gaps between the Studio Traps do lessen the maximum amounts of isolation and separation available compared with the more traditional acoustic screen, they do have the advantage of not psychologically cutting off the performer as much as traditional screens often do. Although often used for vocal recording, they have also been used around drumkits, next to grand pianos, to provide enhanced separation between sections of an orchestra, to help with separation and focus when recording brass sections — the list of possible applications seems almost endless. Soundfield can supply an 'Attack Wall' set of eight Studio Traps plus a pair of 16‑inch monitor stands for just over £2900, and you could use these for recording, mixing, and general-purpose playback duties. If I regularly recorded on location, I could certainly justify this expense against the saving in time and frustration when dealing with unfamiliar venues. One of the difficulties of using acoustic screens is that because they tend to absorb most of the top and mid-range, what gets past them is very bass-heavy. While the sound at the mic may be just what you need, the spill that reaches other mics sounds very unnatural. When the Studio Traps are used in a typical configuration, they will cut the background noise levels from outside by a claimed 5dB, while the reflective side typically enhances the local instrumental or vocal level by 2dB. So, the combined effect can be a 7dB improvement in signal‑to‑noise ratio inside the trapped area. Meanwhile, what gets past the gaps between the traps will be a balanced sound, which will cause fewer problems with other mics in the vicinity. Extremely portable, as well as being quick and easy to set up at different heights. Provide useful separation and control of room reflections. Reflective/Absorptive sides provide great versatility. Spill has a balanced frequency response. Wide variety of potential applications. Maximum separation is less than with traditional acoustic screens. An easy-to-use, versatile and effective system that will solve many acoustic problems in a flash. ASC Studio Traps £311.38; Attack Wall (eight Studio Traps and a pair of 16‑inch monitor stands) £2938. Prices include VAT.